The Stormwater Committee develops, recommends, supports, and conducts programs to promote the overall understanding of stormwater management strategies, including those related to operation, maintenance, and management practices. We are a new committee with hopes to present stormwater webinars, sponsor a pre-conference workshop and a stormwater track at the 2016 Annual Conference, and submit articles focused on stormwater for the PNCWA Newsletter. Watershed and Stormwater Retrofit Planning Webinar Now Available Online! On July 18, 2017, the PNCWA Stormwater Committee sponsored a webinar featuring three experts in watershed and stormwater retrofit who will discuss issues, tools, and techniques for watershed and stormwater retrofit planning for various-sized jurisdictions across the Pacific Northwest. The presentation highlighted several innovative stormwater strategies being used by jurisdictions to reduce flooding, enhance water quality treatment, connect people to nature, enhance wildlife habitat, and expand watershed resiliency. Now, the webinar is available on our Committee Activities Page. Click here for more. An empty lot in Manchester now does double duty as a pleasant community space and a workhorse to clean polluted runoff for Puget Sound. 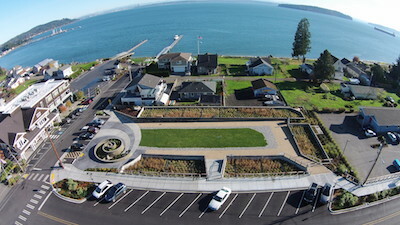 The Manchester Stormwater Park is the Puget Sound area’s first stormwater park, and one of only a few such combined treatment/recreation facilities in the nation. The project was initially designed to replace an aging and undersized outfall. However, Kitsap County recognized a unique opportunity to treat a larger drainage area and correct some flooding issues as well as enhance the community. The Stormwater Park treats stormwater from roads, parking lots, commercial property, and residential areas to today’s strict standards through innovative Green Stormwater Solutions (GSS) using soil and plants. Stormwater from approximately 100-acres upland of downtown Manchester is collected and channeled to the new Stormwater Park. Treatment cells located around the perimeter of the park accept storm flows into 18 distribution channels that are positioned to uniformly deliver the water onto treatment beds. The beds contain an engineered filter media and plants that can tolerate periods of inundation while also cleaning the runoff using filtration and absorption processes. The treatment cells are designed to treat flow magnitudes well exceeding 2,000 GPM. A unique design feature of the park is a spiral rain garden that intercepts low flows from groundwater and very light storms. Runoff is treated through bioretention soil mix and plants in the rain garden. The treated water is collected in a lower drainage system and discharged to a new outfall at the beach in Pomeroy Park. The combination of treatment cells and spiral rain garden removes at least 91 percent of pollutants from runoff before it reaches Puget Sound, forming a sustainable system for treating stormwater runoff for many years to come.